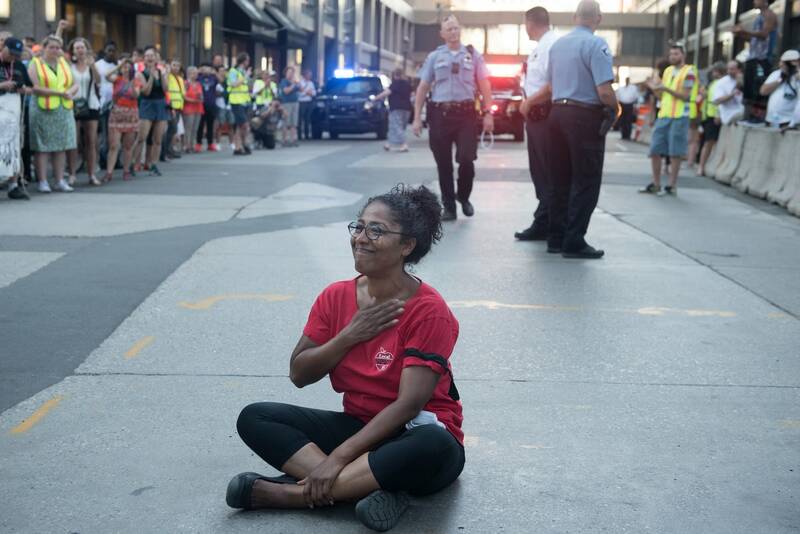 Minneapolis police arrested 21 demonstrators, many of them teachers, as they blocked downtown streets during the Tuesday evening rush hour. 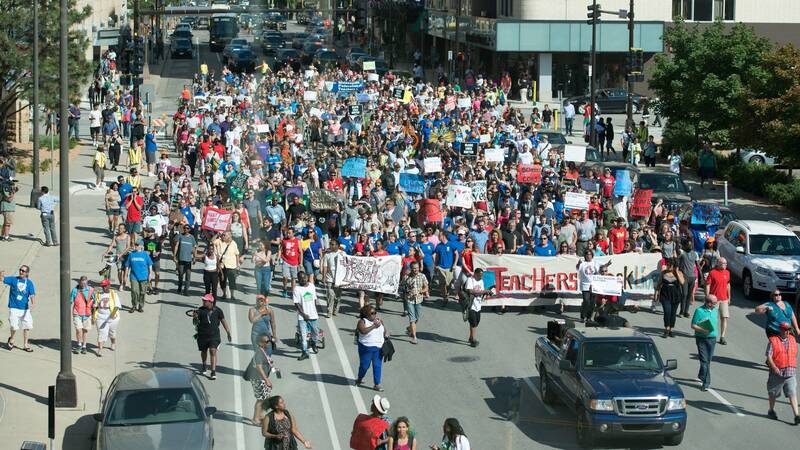 The teachers were part of a crowd of hundreds that marched from the Minneapolis Convention Center, the site of the annual American Federation of Teachers convention. They were protesting the police killing two weeks ago of 32-year-old Philando Castile, who worked in a St. Paul public school as a nutrition services supervisor. The protesters blocked downtown streets for about three hours. They marched from the Minneapolis Convention Center, west on 11th Street, and then north on Hennepin Avenue before holding a rally in front of the IDS Center. Veteran protest organizers from Black Lives Matter Minneapolis led the march. Many of the teachers appeared new to street demonstrations. Shannon Nordby and Lyle Young — who teach in Minneapolis Public Schools — say Castile's death hit close to home. "You work in the schools, you're an educator," Nordby said. "You're not just a school employee." "We need to send a message that this shouldn't happen to anybody," Young added. "Not only because he's black, but anybody. It's just senseless." St. Paul Federation of Teachers President Denise Rodriguez said union leaders were among those arrested Tuesday night. She said the federation is committed to the Black Lives Matter movement, and Castile's death is a tipping point. "We can't just go out and march and grieve and talk and then go back to our lives. We've got to keep the pressure on," Rodriguez told protesters. "And if there's not serious justice for Philando we will be out here again and again and again so we don't add more names under that list." Black Lives Matter organizer Kandace Montgomery said teachers are getting involved with the cause for some very practical reasons. "If we really want to push forward education, if we want to do all these things around closing the achievement gap, we need to actually address the systemic issues that are getting in the way of young students of color — in particular black students — from being able to learn, which at this point is being able to just live." Minneapolis police spokesperson Sgt. Catherine Michal said 21 people were arrested when the protest reached Eighth Street. "The people were given orders to get out of the street. And they did not follow through, and they admitted that they wanted to willingly be arrested for their cause," Michal said. 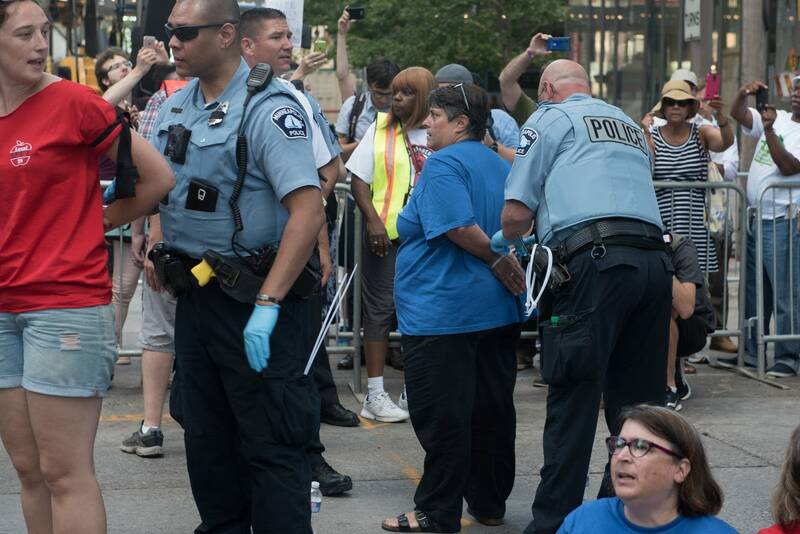 Unlike at recent demonstrations on Interstates 94 and 35W, those arrested were not taken to jail. Michal said the 21 were cited for creating a public nuisance and released at the scene. Besides protesting the killing of Castile, organizers also called on major financial institutions to stop "profiteering" off the lives of people of color. Protesters criticized what they say is the role of big banks in the payday loan industry, private prisons and the subprime mortgage crisis.